Another month is in the books. I hope that everyone had a fantastic month during March. I am very excited about this update because it is full of a lot of good news. 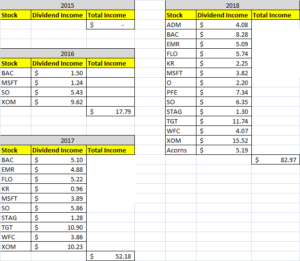 A lot has been going on like making some purchases, setting a personal best in dividend income and I am setting up More Dividends for more success in the future. The market has been very crazy lately but I have been trying to use these swings to my advantage. I will continue to look for more opportunities in the future to make some more purchases. I am working towards building on some areas of the site. So if you are interested in having your website listed on my blogroll just let me know in the comments. So let’s take a look back and see how my portfolio has changed during the month of March. There were 2 major additions to the portfolio during March. Both of them are new positions and I look forward to building onto them in the future. These additions really help me toward my goal of $1,000 in dividend income. I am still a long way from it but I am making all the right moves to get me there. March produced the most dividend income for me yet. I am highly anticipating the $100 in a single month milestone. I should be able to reach this milestone very soon. 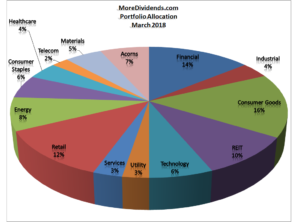 March was the last month of Q1 and accounted for $82.97 of my 2018 Dividend Income. In total during 2018, I have earned $139.75 in dividend income! That is 13.975% of my 2018 goal. 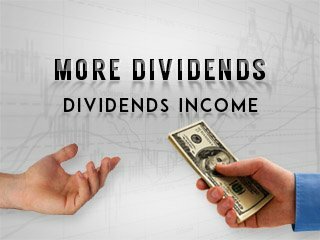 Year over year, I saw a 59% increase in dividends earned during the month of March. The reinvested dividends helped out here but the additions were the real powerhouses. 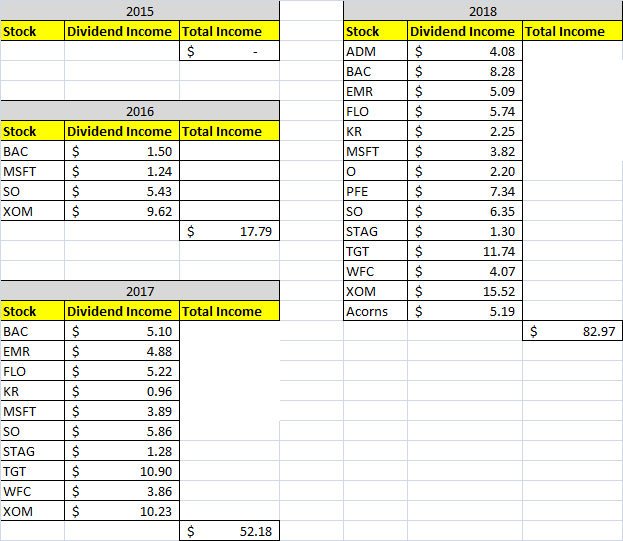 I hope to be able to continue producing this kind of year over year growth but I am seeing the growth rate slow down the larger the amount of dividend income grows. I do not mind as long as I continue seeing growth because I will not be able to keep up the growth by purchases alone. With these new additions in the portfolio I notice a shift. Consumer goods now seems to be my heaviest sector. I will continue to keep a watch on this while looking for some opportunities in some other areas. Underneath the usual pie chart I have included a list of how I classify each company that I own. I am in debate on some of them but will leave them as is for now. If you have any thoughts on the way I categorize them, I would love to hear them in the comments. I can see in this new image that several of my positions have went in the red so I will keep an eye on them. It may prove to be a good opporunity to lower my cost basis. Overall though I am happy with the current state of my portfolio. What a great month. This was the type of month that gets me excited about what I am doing here. The additions will help me build up this stream of income along with the reinvested dividends. I will continue to look for great opportunities to expand this portfolio. It is doing great and producing some superb results for me. I want to take a minute and thank everyone in the DGI blogging community. I have been able to meet and talk to a lot of great people who I am able to learn from. In the years that I have been apart of this community not once have I ever seen any negative comments. Someone may disagree with a point of view but it has always been handled with the appropriate decorum. I am glad to be apart of this community and I appreciate and respect everyone else who is involved. Keep up the good work. It must feel great hitting a new dividend milestone. Keep on your track and I’m sure more records will follow. As always, it’s nice to see some names in common paying us. I see a handful of similar stocks paying us both. Like you, I’m also looking at some of my positions that are in the red for future potential buys but want to be careful not to get too heavy in any one name as a result. Amazing stuff! That’s awesome that you set a new record and posted one nice dividend growth rate along the way. That’s what I’m talking about. As Divhut said, we have some very similar names on our list for the month, which is always great to see. Keep pushing and keep on striving for that next great record. Cheers! Woohoo, congrats on the record month! It’s fun to see those numbers grow.